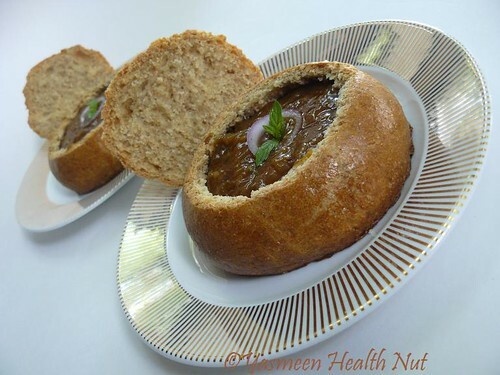 I was always fascinated by the soups and stews served in the adorable bread bowls.Looks challenging but If you can bake a bread then these are unbelivebly simple to make.Vegan French onion soup is the simplest soup to serve in these bowls.It so happened I had to empty the pantry of onions and flour the day before moving to Columbus,the soup in bread bowl seemed perfect to use them up.With no cheese in the fridge and no time for shopping for any, I made it all vegan,Mr.health nut couldn't be more happy(he is always grateful to skip cheese). Adapted from Suite101.com.The original recipe uses tahini and miso(soy paste) as a substitute for cheese.Again I didn't have those in stock and are missing in my recipe. Heat oil in a large pan over medium-high heat. Add the onions and saute until lightly brown.add the garlic and saute another minute or two.Cover and cook for 25-30 minutes on medium-low heat until onions are tender,stir occasionally.Add the sauce ,pepper and vegetable broth,bring to a slow boil. Mix the cornstarch in tablespoon of water and add to the boiling onion mixture,keep stirring to prevent lumps.simmer for about 3-4 minutes.Serve in soup bowls with crusty bread or make you own bread bowl as follows. Sprinkle some Swiss cheese or Gruyere over the soup bowls and melt under the broiler for 2-3 minutes and serve. One can skip the Bake again part, I baked the second time for a more crusty texture to the bowls.Method adapted from ehow. Dissolve the yeast in warm water, stir in the sugar and allow the yeast to get frothy, about 10 minutes.In a large bowl combine the flours, salt and oil. Add the yeast mixture and knead until well combined and smooth.Apply some more oil on the sides of the bowl cover and allow to rise until double it size about 2-3 hours. Punch down the air from the dough.Knead for a minute.Then divide the dough in to 2 equal portions.Shape in to a round shape about 5 centimeters in diameter and place on a greased baking sheet,cover with a kitchen towel and proof for another hour by allowing to rise one last time before baking. brush the dough with a table spoon of egg wash(mixture of egg and water) evenly all over. Place in the middle rack of the oven and bake for 30-35 minutes until the crust is golden brown and sounds hallow when tapped.Cool for at least 15-20 before slicing off the top of each of the bread roll with a serrated knife. 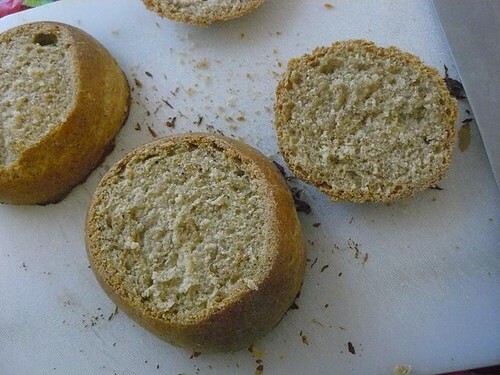 After cutting off the top,scoop out the some of the insides of the bread,carefully not to remove too much or the bread bowl might leak.These can be used as a dip in the soup. 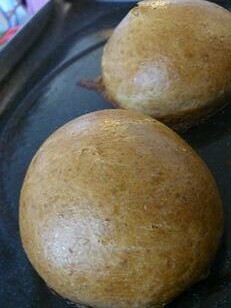 Bake again at 350F for 5-6 minutes until the bread bowl is slightly toasted.Now transfer them on to serving plate.Ladle the warm onion soup until 3/4th full,garnish with herbs or if topping with cheese melt under the broiler for 3-4 minutes and serve. The pictures were taken in a jiffy with all the moving chaos at home,almost thought of skipping the photo session and get straight to eating them.But since this is so apt for The Click Click - Allium,glad I could spare few minutes. My first attempt at bread bowls these are also my entry for BBD #23:Something you have never made before and Susan's Yeast Spotting,hosted this week by Macheesmo. 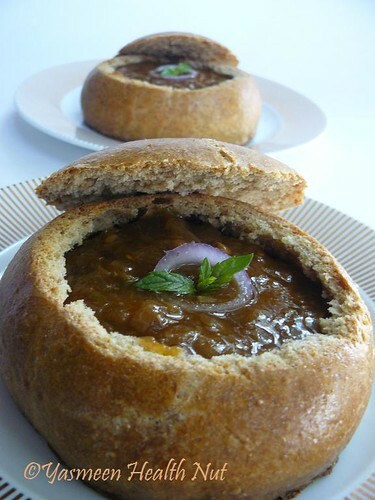 Very nice and delicious recipe dear, bread bowl is awesome. Great idea! When I was in Montreal 2 years ago, I ate one of those french soups served in a bread bowl, it was awesome. Thanks for the recipe, I'd love to give it a try one day. Have a nice day. AWESOME DEAR.Love the bowl.I used to be in awe of the bowl as well.Love the vegan soup.I too had bookmarked the same recipe but was not sure whether it will be good or not.Now that I have seen yours,I think I should go ahead.Perfect entry Yasmeen. French onion soup is probably my favorite kind of soup! At restaurants I always look for it on the menu. Yours looks so thick and delicious, I will definitely be making it...thanks for the great recipe! Those are lovely! I've never thought to make bread bowls at home. Love the bread bowl,looks cool. I have an award for you on my blog, dear. Kindly accept it.. The bread bowl looks really great so does the soup. The bread bowl looks very nice. First time seeing soup being served in a bread bowl. Looks very nice. Hope to try it sometimes. Please participate in A.W.E.D German going on in my blog. Wow.. lovely idea and a great soup treat yasmeen! Amazing idea. You really rock. this looks really cute and nice. very creative one. Hats off to you. very cute bread bowl..good one yasmeen..
Wow thats so creative yasmeen, bread bowl looks so good! beautul concept of serving the soup.very inspiring indeed. I love your serving the yummy french onion soup in a bread bowl - delicious! Wonderful pics Yasmeen. One of the best I've seen these past few days.Would love to try this out.Love the bread bowls too. I'm speechless...the bowls look so adorable. that's why you call him Mr. healthnut...no!! and this soup can be called double ka soup..he he..i am drooling again...have to make it soon.. The bread bowl look really yummy! 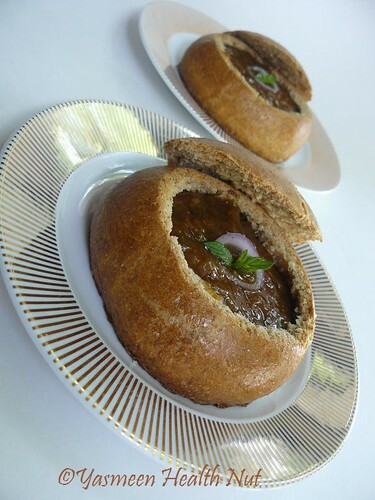 never try to make bread bowl before so I'll have to try them with soup this Ramadan. Fantastic, especially with that homemade bread! A comforting dish! Oh this looks yumm-you've become quite a chef!! Gorgeous presentation! It looks delicious! Great presentation, Yasmeen! Soup in a bread bowl, who could have thought?! I wonder how closely does this vegan onion soup resemble the standard version in taste? Oh well, I guess I will have to try to make it! I love getting soup in a bread bowl. This is a great variation for French Onion, one of my husbands favorites. I'll definitely have to give it a try. I haven't made it in forever. I love the presentation of your soup. The pictures are lovely! 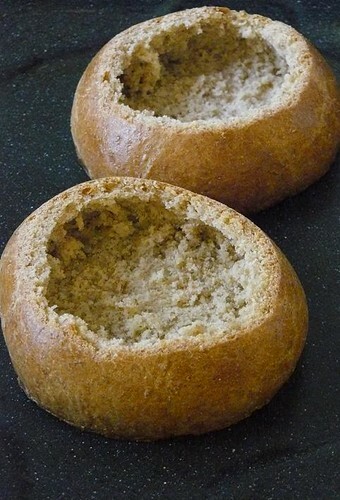 I'm so impressed you made your own bread bowls! Such a cute way to serve soup (which also looks amazing - French Onion is one of my favorites!). Those bread bowls look so cute! Oh my! those look soo cute. Inshallah I will try this sometime. Bookmarked! I just loved this dish and the bowl....Wanted to make onion soup for long. 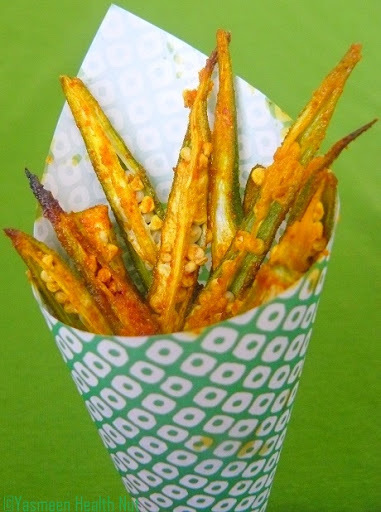 And when i will make it i will make the way u did it!Thx for the recipe sweety.Bookm arked it. 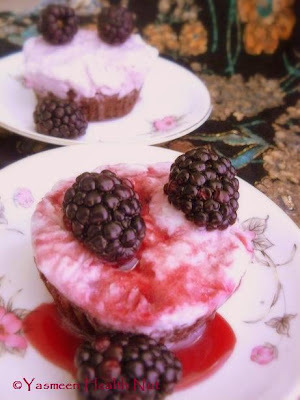 One more thing, I have posted a recipe in my blog now and linked it for the fasting to feasting event. Hope i did it the right way. 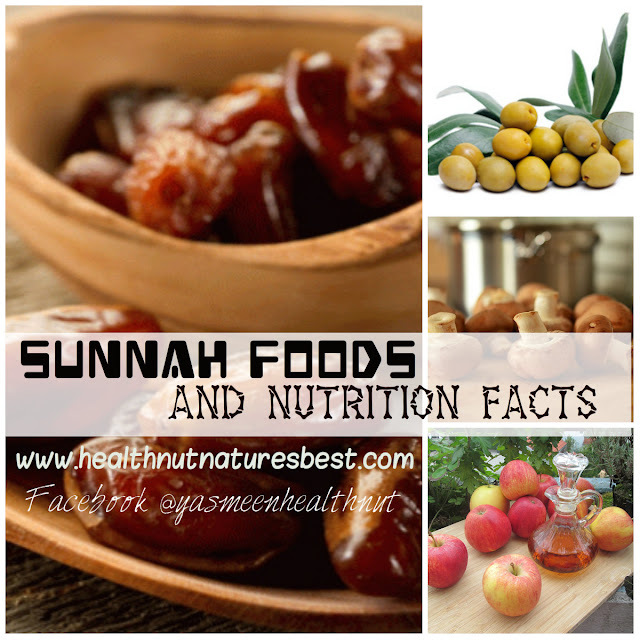 Do I need to do anything else?.Please check it out and let me know.. I really like a nice onion soup and those bread bowls are a great idea! Very cool, I love the bread bowls. I am planning to make some french onion soup soon when the weather cools down a bit. I will remember your bowls :) Thanks for joining us for this month's BBD! It is very interesting for me to read the post. Thanks for it. I like such topics and everything connected to this matter. I would like to read a bit more on that blog soon. It is very interesting for me to read the blog. Thanks for it. I like such themes and anything that is connected to them. I definitely want to read more soon. OH WOW! Finally! I have been looking for this recipe for so long!